Here is a card I have made inspired by the wonderful Stephanie (thank you hun! ), I loved the colours on her card so I have used them on mine. I have first taken some PTI Kraft CS and made this into a card base then added a strip of PTI SS White CS down the middle. 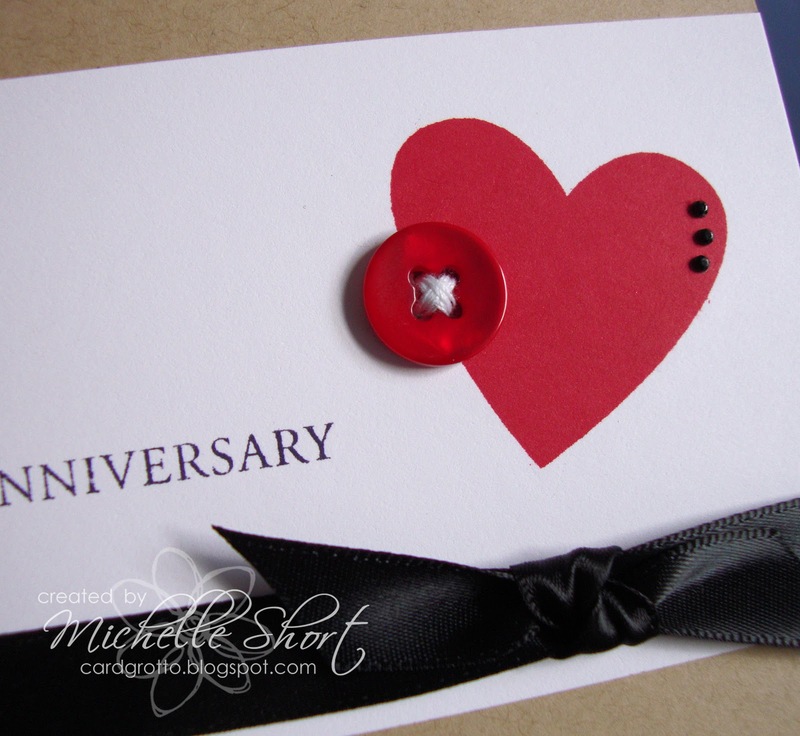 I have used the Waltzingmouse Stamps Sweethearts Set and stamped the heart in PTI Pure Poppy ink then the greeting in PTI True Black ink. I have wrapped around with PTI True Black Satin Luxe Ribbon and tied at the front. I have then added a PTI Pure Poppy button stitched with WRMK Floss and added tiny black rhinestones to finish. STAMPS: Waltzingmouse Stamps. INK: Paperrtrey Ink True Black & Pure Poppy. CS: Papertrey Ink. EMBELLISHMENTS: Papertrey Ink Satin Luxe Ribbon, Papertrey Ink Button, We R Memory Keepers Sew Easy Floss, Papermania Adhesive Rhinestones. ah this is lovely Michelle, love the fonts, very elegant. 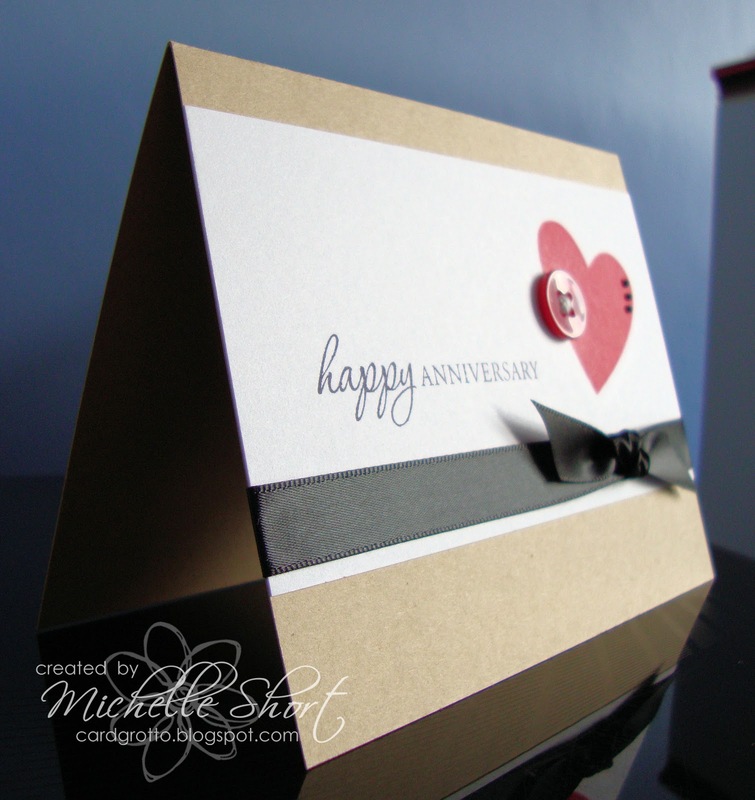 A simple yet stunning card Michelle .... Well Done. 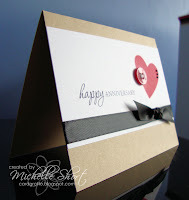 This is such a beautiful card Michelle. Fabulous card Michelle, a great layout and design.